What is the appeal of a harder path in life? Why do a lot of women choose this route when it comes to men? Yes, ask yourself why, seriously. Wanting what you can’t have is ignorance. Doing things that make you unhappy -that aren’t easy for you (apart from going to the gym)- is ignorance. This is a path filled with resistance. Resistance is misery. Ignorance leads to misery. Where does this ignorance come from? False view or belief. It’s the view that someone can fulfill your dreams and desire and they’re the one-way ticket to bliss. It’s the belief that when you get validated by your object of obsession’s approval, everything will be right in the universe. Right now, the universe isn’t quite right yet but it will be once you get him. And of course the very mindset is why the universe is never quite right. Even by sheer chance that you succeed in getting him, you will soon find things about him that are very upsetting to you because he’s still the fountain of your emotional well-being. You are projecting your ideas and fantasy of a holy grail of a relationship on a mere mortal. How many couples divorce after a passionate love affair in the beginning? And didn’t you just divorce your ex yourself? Newness doesn’t make him “IT.” Newness is why you can’t see beyond now other than the projection of your craving mind. The craving is the problem. Like a sugar rush, it’s very comforting to indulge in it for a while till you crash. And this man will eventually disappoint you as well like other men before him. So you are creating this misery yourself. A lot of these issues aren’t really issues had you been wise enough to let go when the “going gets tough.” Or it would never get tough to begin with had you been hanging on loosely. Instead you keep investing, keep obsessing, keep projecting and you are sucked in deeper and deeper in the melodrama your craving mind creates. You’re playing out the movie you create in your head because you are unconscious. Right now I’m in the middle of Fem inine Magnetism group coaching. 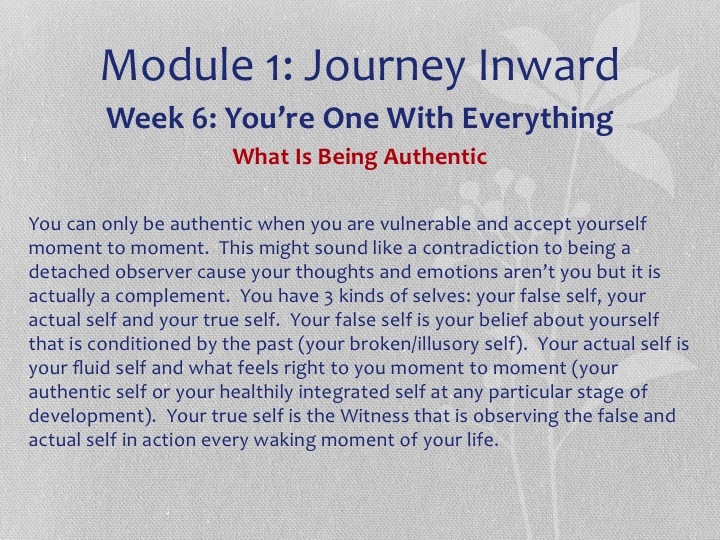 We have just finished Module 1 Journey Inward and will start with Module 2 Understanding Men and Four Components of Melting His Heart (you can sign up here). 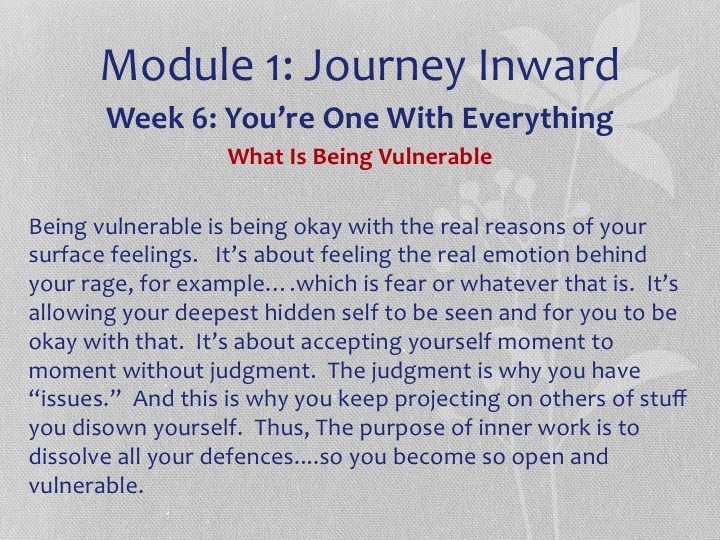 In Module 1 we discuss a lot of aspects of the craving mind and how it creates our reality and suffering. When you suffer emotionally it’s because you are trapped in the egoic consciousness. Egoic consciousness is marked with grasping and aversion. You grasp when you have contact with pleasure or pleasurable sensations. You want more of it. You want it to stay the same. You want to repeat it day in day out. You are attached. You avert/resist when you have contact with pain or unpleasurable sensations. You are trying to escape. You want it to change it right here right now. The tension between the two -between chasing and running away from/resisting- renders you restless. You never feel at home. The universe is only right momentarily before it goes back to a state of complete dissatisfaction in no time. Through the seeing of the mechanics of attachment you will understand why you suffer unnecessaril y. The only way out of that predicament is, naturally, to get out of that very restrictive mode of consciousness by expanding it. 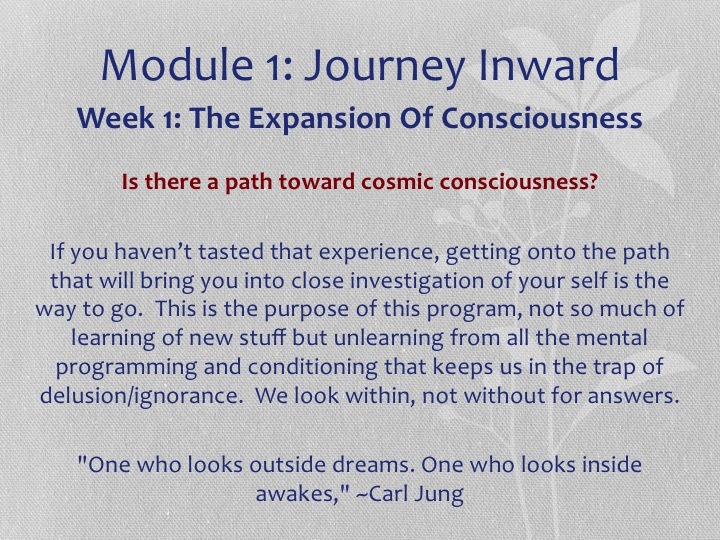 How do you expand your consciousness? 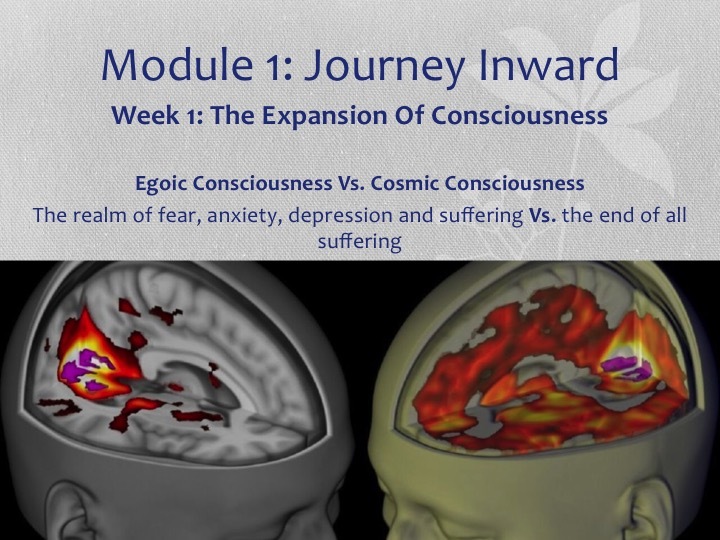 How do we evolve toward cosmic consciousness? By practicing awareness. By being mindful of any movement in your inner space. By removing the blinders. By demolishing the false idea of the self. By expanding your conception of self so you include everyone and the entire cosmos in it. Your brain has two hemispheres, left and right. Left hemisphere thinking is logical, practical and mathematical. Right hemisphere thinking is non-linear, intuitive, abstract, big-picture focused, and creative. Can you guess which brain-half is dominant for you? Numerous studies have shown that humanity’s greatest thinkers, inventors, artists, and scientists use both brain hemispheres together, in unison. Meditation has been scientifically proven to synchronize your left and right brain, allowing extremely beneficial changes in hemispheric thought communication, neural chemistry, and intellectual processing power. Its true, meditation super-charges your brain! By destroying the illusory sense of separation. The mental chatters (your stories) are what create this separation. You call them culture, values, political view, religious belief or whatnot. They are just conglomeration of thoughts. People kill thanks to those thoughts. They create enemies with those thoughts. 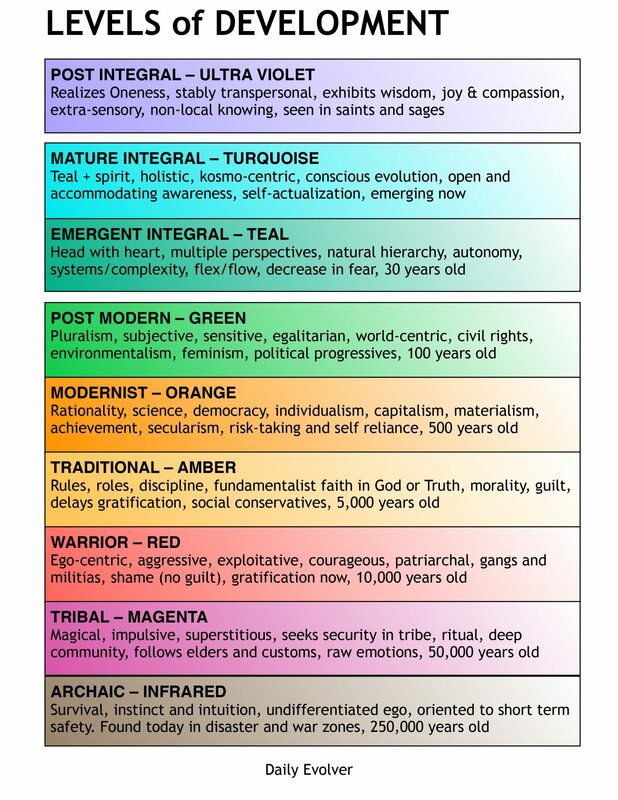 Look at the world over -at our terror plagued societies-, majority of people are still trapped in this level of consciousness (see Ken Wilber chart above: amber and lower). When you know how to turn down the volume of your mental chatters, you feel natural connection with the cosmos. That is your True Self. So the very purpose of this program is to usher you to a higher level of consciousness that allows you to see things as they are. You can only see your issues objectively when you can rise above them. You can’t see when you are in the middle of them. Expanded consciousness will allow you 360° vantage point that allows you to see from every angle. It’s like you can see relationships between things and connections from one spot to the next when you are standing on an elevated ground. Thanks to that you will become 100 times more functional and effective human being. You will accomplish more by struggling less. You will be happier and more peaceful. Life is way easier for you cause you have a 20/20 vision. It’s magical place to be. It’s a totally different world. You will learn how to be vulnerable and authentic. You can be yourself moment to moment cause you accept yourself without judgment. You are moderate and well-rounded. You have owned your shadow so you are no longer a reactive ball of nerves. You become less and less judgmental. You are at peace with yourself and with the world. The dropping away of fear as the self is dropping away. You don’t have the anxiety and fear most people have anymore: fear of the unknown, fear of some imagined future event, fear of not being good enough, fear of failing, etc. The self lives in psychological time. You no longer live in the psychological time of the past and the future. Psychological time leads to fear and sorrow. You don’t cling and dwell on any particular thought anymore. Nothing has the same meaning anymore. A lot of times you just don’t want to think. If you do think it comes and goes without leaving any mark behind. You’re like a teflon, nothing sticks anymore. You’re light as a feather. You feel rather than think more. When thinking is put in its right place, it’s no longer domineering your inner realm. As thinking recedes, feeling arises. You feel directly without the influence of thoughts. Thanks to that you have an acute intuition. The paradox is…. Your emotions are mostly flat. You no longer have the ups and downs of feelings most people have day to day. You feel awed, amazed, touched, moved, compassionate, grateful and tranquil much more often than the opposites. Your default emotion is serenity (calm and joy). You have slowed down your mental process so much you can muster a conscious decision, more often than not, to continue on a passage of thought or abort it knowing first hand the nature of the thought (either willy-nilly futile thinking or creative thinking). You are able to do it cause there is a gap between you and your thoughts. When you realize it is an interesting creative thought process you allow your mind to probe and explore as if you weren’t even involved in it. In the old days, this is how prophets got their revelations. This is how I transmit my insights to you all week to week with my classes. You become a deliberate thinker. You only think (which means continuing on a thought process) when you need and choose to like when you need to solve problems. You become a sole master of your inner world. You are king to your mind, not slave to it. You are a powerful creator of your dream and reality. You are the Seer cause your divine intelligence is activated when mundane thoughts recede to the background. You are rarely triggered. You become much less neurotic. Being triggered is a sign of denying a certain part of ourselves because it’s so painful or shameful and as a defense mechanism we project that suppressed unclaimed part of us (our shadow) onto the person who triggers us. Being triggered, thus, is a sign of being unconscious. You are rarely stressed and never depressed. You can see what most people aren’t privileged to see. With that holistic understanding of the world and human nature you vibrate from a much higher frequency than most people. You are the sort of person people come to seek counsel because your vantage point is so all-encompassing. You don’t judge yourself, hence your lightness of being is a magnet to people and in turn it’s allowing others to alleviate their self-judgment and -in turn- their judgment of others. You like yourself, hence it’s easy for you to like others. Judgment is when we assess a situation not coming from a place of acceptance but a belief that our way is the only way and we need to change others. That means you have that unclaimed side of you. Each time something evokes an emotional reaction in you, it’s an indication that you are fighting your shadow. Hence, you can see that self-judgment goes hand in hand with judgment of others. Self-acceptance goes hand in hand with acceptance of others. The end of becoming. You are no longer enslaved by impulses, drive, ambition and desire to become somebody that to most people are why they are anxious and unhappy. You are fluid moment to moment not being ruled by an idea of a certain ideal self either now or in the future and you surrender to the flow of life with a mind filled with contentment and curiosity. The end of sorrow. The end of grasping and resistance is the end of sorrow. The sorrow-free mind is a instrument of life. It surrenders to the flow of life. 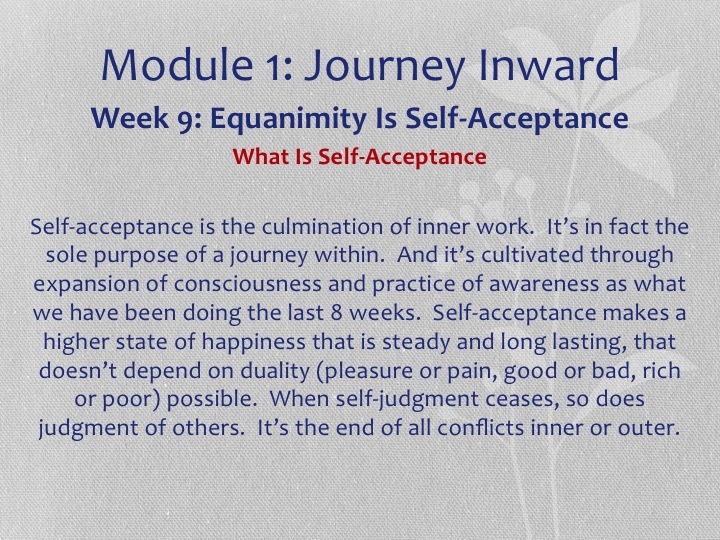 It’s what equanimity is all about and it’s the culmination of this program. Equanimity equals freedom. It’s liberation from duality, from grasping and aversion. You are one with what is because you accept yourself moment to moment. “What is” is however you are moment to moment. You are at peace with it. You are not separate from what is and the rest of the world. By focusing on your personal evolution you contribute so much to the evolution of all mankind. This is what this world needs today, more than ever. Only evolution of consciousness will guarantee our survival as a species. We can do this together. You can now own the entire 11 classes of Module 1 Journey Inward here. This is going to be an investment that will change your life forever. It works much faster and way cheaper than traditional therapy. Not only you’re going to be a total goddess in your relationship with your man but you will also become an agent of change. You’ll be at the leading edge of the evolution of consciousness. MORE: What If I Tell You That The Only Way To Get Him Is To Let Him Go? Katarina, PLEASE you need to tell me what to do, my situation makes me crazy! to believe..) he explained it just felt good to “have” me there for him because at times he felt lonely and he appreciates me for that. but he said that he doesnt love his wife either and he just sees her as a friend, he wants a divorce but does not want to hurt her (or more importantly lose money to her, yet he says it’s just a matter of time) he also stated he doesnt want to hurt me or lead me on, and that he wants to be friends first and take things slow, and see where it goes. but i just feel like no matter what i do, nothing happens or changes. he says we are “friends” and he wants to see “where it goes” yet he never does anything to get to know me more or bring things forward? i don’t initiate, he doesn’t either. it’s almost like he could take it or leave it, yet he is obsessed with me and what i do because he monitors me every day. if i mirror him it’s like he gets scared at first, but then he gets mad i think because then it gets worse, almost like a “who cares less-contest”. he takes me for granted because he knows he has me, but i think if i do something “bad” like dating others and things like that, he pretends it’s fine but i’m sure he will get very hurt/angry and be too proud to chase me and maybe drop me altogether? if i act distant it’s like he wants revenge and does the same until i come crawling. but then i also feel he is holding back a lot, and that he feels more for me than he wants to admit. i also want you to know he is passive aggressive, and jealous/possessive. im worried, do you think your book will help in my situation? i’m not sure what to do or how to act especially since it’s from a distance and i can’t see him in person. i REALLY want this to work out more than anything in the world, I love him with all my heart. this is extremely important to me. how can i turn this around so that he will love me and pursue me? You’re in an illusory relationship. Move on. Yes my book will help you get a reality check and move on with your life. Read it and start dating again. And of course your pushiness and masculine energy doesn’t help either and my teachings will fix that. And that is where lies the whole problem that pushes him away. You make a mere mortal a source of your happiness and he’s tuned off by that (who wouldn’t?). And this why you need my book more than ever. What you’re saying is so true. I’m going to buy your book as soon as I can. I have read so many of your articles (and yet here I am, asking you about this.. i guess it’s because I need all of this hammered into my head to truly get it) and I have to say that you are fantastic, everything you have written makes so much sense. and i want to thank you, it means so much that you have responded to me about my particular situation here. the thing is i used to think that this was the right way to act, being all honest and open and loving and giving. because in the past he was into that and “rewarded” me with love back when I was acting that way, or he would get angry if i seemed distant at all whenever he was affectionate, so i kind of didn’t dare to stray from acting that way. then all that cute stuff suddenly stopped and i just stood there, confused, wondering why it didn’t work anymore and that i probably had to give him even more, and be even more affectionate so that things would go back to how they were. and they never did. i am always very sweet to him and i can tell he likes it yet he seems “disgusted” by it. but as usual i am sure you are right in what you’re saying, the only way to ever get him is from what i understand: 1. stop being so obsessive about him, stop depending on him for my happiness + life and instead do my own thing. 2. lean back and be less available, show less interest, not initiate contact anymore, let him come to me. 3. mirror his level of interest with no expectations and live my life. 4. focus on me, and be more positive, feminine and independent. from what i understand, you need to create space and show him that you don’t depend on him, so that he can feel “safe” and start coming towards you. the only thing i’m worried about is wether or not he will “get” that i have changed, with the distance and all. is there something i should do to show him i’m different now, so that he won’t think i’m the same old needy person? or will me being less available and not initiating say it all? should i tell him i’m dating others (or insuate it on my blog for example) or just be totally mysterious about my life and not write anything private? i guess this is the only thing that will help my situation, because i have tried everything except this. and if he comes back he comes back. if he doesn’t then at least i am on my way to a better mindset and moving on.